The NSW Aquaculture Association (NSWAqua) is a peak industry body that represents the land-based aquaculture industry in NSW. The NSW Aquaculture Association provides, representation, support, information and a platform for communication between all its members that include commercial producers, hobbyists, educators, suppliers and researchers. Membership is available to all that want to work together towards the betterment of the industry. 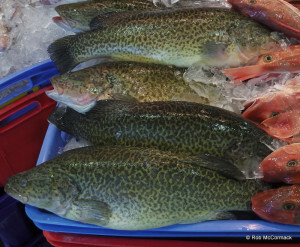 The NSW Aquaculture Association represents and supports land based fish farmers primarily in New South Wales and wider Australia for the sustainable growth of a key food security industry. With seafood consumption in the world on the rise, production in aquaculture is meeting this increasing demand. Total global production of seafood is around 160 million tons and growing strong. Aquaculture is meeting this demand and is the fastest growing food production sector in the world, with about 50% of all seafood consumed worldwide being produced by aquaculture. When you consider global production from the wild harvest is relatively static with an increased pressure on global resources each year and demand for seafood continues to rise each year it’s easy to see that the extra demand must be met by aquaculture product. 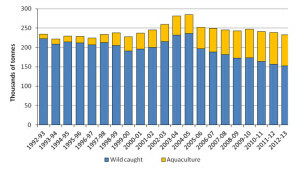 Australian commercial aquaculture, is the fastest growing primary industry in Australia, which now supplies a large portion of the total production. The total aquaculture production has increased by 43% in 2014. This includes a significant percentage in marine species and to a smaller extent, land based aquaculture. NSW probably has the most rules and regulations of any state for commercial aquaculture but that just ensures that the aquaculture produce from NSW is the cleanest, greenest, safest seafood that money can buy. We don’t have the disease and pollution problems that overseas farms suffer from, our farms are designed and regulated for best practice to minimize any problems and ensure the environment of NSW is protected and not affected by our aquaculture activities. Being regulated ensures that the aquacultured fish and yabbies produced in NSW are not only sustainable, environmentally friendly produced but it is produced as food safely for the farmer and the consumer. NSW aquacultured product from the pond to the plate is grown and sold with the health of the consumer in mind so you as a consumer can be assured it is not only safe to eat but it is some of the cleanest, greenest, and healthiest seafood that money can buy. If you are into or are thinking of getting into aquaculture then join the NSWAA to keep informed, if you are looking to buy aquaculture products then buy it from a member of the Association, these members are the ones working together towards the betterment of the industry in NSW and the ones that are doing it right. Print out the application form by clicking the button below and download the manual payments form. Fill it in and mail it to the contact details on the form. Click the button below to select your membership level and make online, secure membership payment and enjoy instant access and benefits. Please use the button below for membership questions to send the Secretary of NSWAA any inquiries you have by email for prompt service.